﻿ V. Fill the gaps with the suitable derivatives of the word given on the right. One of the man’s … building materials is finding its way into a lot of new places these days. Concrete first discovered by the Romans, is now more … used in construction than all other materials together. Concrete is a synthetic stone which can be formed while soft into … any shape the builder wants. Portland cement … with water is the paste that binds sand, gravel, clinker into an … rock that becomes … as the years pass. It was called Portland because Joseph Aspolin, the English … who invented the first … scientifically made cement thought it resembled the rock excavated on the isle of Portland on the Dorset Coast. VI. Read the passage and answer the question:Why does prestressing significantly reduce the amount of structural materials? Often concrete is the main construction material in modern bridges. Reinforced concrete to which emplanted steel bars add strength, was introduced in 19th century; its first significant application was in an arched bridge built in France in 1898. Engineers later learned to apply tension to the bars before pouring the concrete. This process called prestressing significantly reduces the amount of structural materials needed for a bridge. Prestressed concrete bridges often have a graceful look which cannot be achieved by iron and steel bridges with their geometric configurations. Bridges are designed, first, to carry their own permanent weight, or dead load; second, to carry traffic, or live loads; and, finally, to resist natural forces such as winds or earthquakes. Live load and dead load. The primary function of a bridge is to carry traffic loads: heavy trucks, cars, and trains. Engineers must estimate the traffic loading. On short spans, it is possible that the maximum conceivable load will be achieved—that is to say, on spans of less than 100 feet (30 metres), four heavy trucks may cross at the same time, two in each direction. On longer spans of several thousand feet, the maximum conceivable load is such a remote possibility (imagine the Golden Gate Bridge with only heavy trucks crossing bumper-to-bumper in each direction at the same time) that the cost of designing for itis unreasonable. Therefore, engineers use probable loads a basis for design. In order to carry traffic, the structure must have some weight, and on short spans this dead load weight is usually less than the live loads. On longer spans, however, the dead load is greater than live loads, and, as spans get longer, it becomes more important to design forms that minimize dead load. In general, shorter spans are built with beams, hollow boxes, trusses, arches, and continuous versions of the same, while longer spans use cantilever, cable-stay, and suspension forms. As spans get longer, questions of shape, materials, and form become increasingly important. New forms have evolved to provide longer spans with more strength from less material. Forces of nature. Dead and live weight are essentially vertical loads, whereas forces from nature may be either vertical or horizontal. Wind causes two important loads, one called static and the other dynamic. Static wind load is the horizontal pressure that tries to push a bridge side­ways. Dynamic wind load gives rise to vertical motion, creating oscillations in any direction. Like the breaking of an overused violin string, oscillations are vibrations that can cause a bridge to fail. If a deck is thin and not properly shaped and supported, it may experience dangerous vertical or torsional (twisting) movements. The expansion and contraction of bridge materials by heat and cold have been minimized by the use of expansion joints in the deck along with bearings at the abutments and at the tops of piers. Bearings allow the bridge to react to varying temperatures without causing detrimental stress to the material. In arches, engineers sometimes design hinges to reduce stresses caused by temperature movement. Modern bridges must also withstand natural disasters such as hurricanes and earthquakes. In general, earth­quakes are best withstood by structures that carry as light a dead weight as possible, because the horizontal forces that arise from ground accelerations are proportional to the weight of the structure. (This phenomenon is explained by the fundamental Newtonian law of force equals mass times acceleration.) For hurricanes, it is generally best that the bridge be aerodynamically designed to have little solid material facing the winds, so that they may pass through or around the bridge without setting up dangerous oscillations. 1. Bridges must carry dead loads, live loads and resist natural forces. 2. The traffic loading is the same for all kinds of bridges. 3. Maximum conceivable load may be achieved on short and long spans. 4. If engineers estimate maximum load for spans over several thousand feet, the cost of a bridge will be very high. 5. Usually engineers use probable loads as basic for design. 6. On short spans the dead load weight is greater than the live loads. 7. Long spans must be designed to minimize dead loads. 8. Longer spans are built with arches, trusses, hollow boxes. 9. Forces from nature are essentially vertical loads. 10. Dynamic and static wind loads push a bridge sideways. 11. Vibrations can cause a bridge to fail. 12. The use of expansion joints in the deck along with bearings at the abutments increase the expansion and contraction of a bridge materials. 13. Bearings and hinges reduce stresses caused by temperature movement. 1. What are dead and live loads? 2. What must be taken into consideration designing a bridge? 3. Why is the maximum conceivable load different for short and long spans? 4. How do the loads differ on short and long spans? 5. What are shorter spans built with? 6. What questions arise as spans get longer? 7. What loads does the wind load? 8. What static wind load? 9. What is does dynamic wind load cause? 10. What can happen if a deck is thin and not properly shaped? 11. What is done to reduce stresses caused by temperature movement? 12. Why do structures with light dead weight withstand earthquakes better? III. Match the meaning of the terms with their definitions. 2. The load that a bridge must support in addition to its own weight. 3. A permanent and fixed load, such as the weight of a bridge or building. IV. Match the words with their synonyms. V. Match the words with their opposites. VI. Fill in correct prepositions. 1) … the same time; 2) … each directions; 3) to give rise … sth; 4) to react … sth; 5) … general; 6) to arise… sth; 7) to be proportional … sth; 8) to set … sth; 9) to pass … sth. Materials used in bridge construction. 1. What famous bridges do you know? 2. Which of them are your favourite? Why? 1. What type is the Firth of Forth Bridge? Despite its unusual appearance, the bridge that spans Scotland's Firth of Forth has a lot in common with the simplest and oldest bridge type: the post and beam bridge. In a post and beam bridge, solid ground or columns, called piers, on opposite banks of a river or gap support long horizontal beams, often with support from supplemental columns at regular intervals along the way. Similarly, the Forth Railway Bridge spans the waterway called the Firth of Forth. In one important and innovative way, however, the Forth Bridge, designed in the late 1800's by structural engineers Benjamin Baker and Sir John Fowler, is very different from a simple beam bridge. Whereas a beam bridge relies on the strength of the beam spanning the distance between columns to carry its own weight, as well as the loads generated by cars and trains that travel over it, the Forth Bridge uses a cantilever system to counteract the downward force generated between columns. The two main beams that make up a cantilever bridge rest almost perfectly balanced on piers located part of the way across the span. One end of each beam is also anchored to the nearest bank, while the other end stretches toward the center of the span, like a diving board over a pool. These suspended ends are joined by a relatively lightweight connecting span. The Forth Bridge's shape -- tall and busy with many angled supports in some areas, almost dainty in others -- results from the need to be both as strong as necessary and as light as possible. The midsection of each beam that attaches to the piers and carries most of the beam's weight and its load must be very strong, so engineers increased the depth (or height) of the bridge in this location, making it resistant to bending even under extreme loads. In contrast, the connecting spans, which are supported entirely by the main beams they connect, are built minimally to be as light as possible. Such a design allows the Forth Bridge to span a much greater distance with many fewer vertical piers than a typical post and beam bridge would require. · The Firth of Forth Bridge may not have been a bridge at all -- engineers considered building a tunnel, but abandoned the idea because it seemed too risky. · The Firth of Forth was the first bridge built primarily of steel. 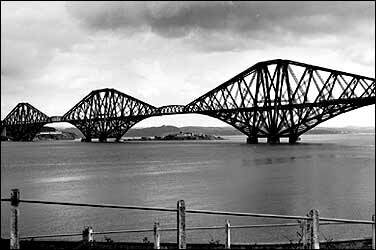 · It took 54,000 tons of steel; 194,000 cubic yards of granite, stone, and concrete; 21,000 tons of cement; and almost seven million rivets to build the Firth of Forth Bridge. · The midsection of each beam that attaches to the piers and carries most of the beam's weight. 1. The Firth of Forth Bridge has nothing in common with the oldest bridge types. 2. The Forth Bridge relies on the strength of the beam spanning the distance between columns to carry its own weight. 3. The Forth Bridge was designed by structural engineers Benjamin Baker and Sir John Fowler. 4. The Bridge uses a cantilever system. 5. Suspended ends of the bridge’s beams are joined by a heavy and strong connecting span. 6. The Forth Bridge's shape results from the need to be light as possible. 7. The connecting spans of the bridge are built to be as strong and heavy as possible. 8. The Firth of Forth was the first bridge built primarily of steel (54,000 tons). 9. Such a design allows the Forth Bridge to span a much greater distance. 10. The purpose of the bridge is a roadway. 1. It’s said that the Firth of Forth has much in common with the simplest and oldest bridge type. Do you agree? How can you prove the statement? 2. The bridge’s engineers Benjamin Baker and Sir John Fowler made the Firth of Forth different from a simple beam bridge. In what way? 3. What was a canteliver system used for? 4. What did the shape of the bridge result from? 5. In what way was the midsection of each beam made strong? 6. Why were the connecting spans built lightweight? 7. What materials were used to build the bridge? 8. What was the reason of building a canteliver bridge at that location? II. Write derivatives of the following words. Imagination was given to man to compensate him for what he is not. A sense of humour - to console him for what he is.